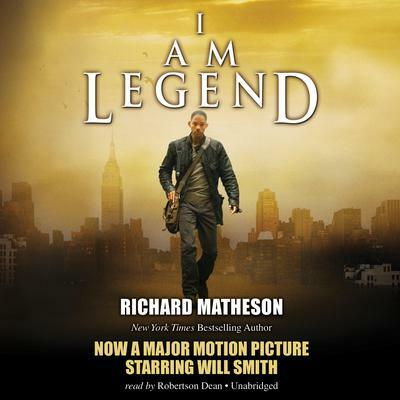 The basis for the film starring Academy Award nominee Will Smith, I Am Legend is a classic of horror and suspense. In I Am Legend, a terrible plague has decimated the world, and those who were unfortunate enough to survive are transformed into bloodthirsty creatures of the night. Robert Neville is the last living man on earth. Every other man, woman, and child has become a vampire, and they are all hungry for Neville’s blood. By day, he is the hunter, stalking the sleeping undead through the abandoned ruins of civilization. By night, he barricades himself in his home and prays for the dawn. How long can one man survive in a world of vampires? Richard Matheson’s chilling tale is a white-knuckle ride into a world of darkness and terror. The basis for the film starring Academy Award nominee Will Smith, I Am Legend is a classic of horror and suspense. In I Am Legend, a terrible plague has decimated the world, and those who were unfortunate enough to survive are transformed into bloodthirsty creatures of the night. Robert Neville is the last living man on earth. Every other man, woman, and child has become a vampire, and they are all hungry for Neville’s blood. By day, he is the hunter, stalking the sleeping undead through the abandoned ruins of civilization. By night, he barricades himself in his home and prays for the dawn. How long can one man survive in a world of vampires? Richard Matheson’s chilling tale is a white-knuckle ride into a world of darkness and terror. The Movie was good but the book is better! I think this book is 10x better then what the movie did to it. I don't give away plots in my reviews but I will say this, other than the title, the movie does not follow the book at all. Listen and enjoy. Narrator does a great job too. I will usually try to listen to the book before the movie, as I think most people do. This book on its own merit was creepy. A good old survivor, surrounded by the creatures of the night. No spoilers, not even the movie could spoil this ending! Robertson Dean was great. The pain, sorrow, loneliness, perfectly portrayed. Loved this book's ending. Better than the movie (which I enjoyed just as much)! Robertson Dean is one of my favorite narrators and he doesn't disappoint on this book. A great story and great narration.